Dream Create Inspire: Happy Valentine's Day! My card for today uses the amazing Feb/11 Art Freckles card kit and the adorable Paper Makeup Stamps Billy and Bianca Love Bunnies image! All contents are from the Art Freckles Feb/11 card kit plus Bazzill cs, Neenah cs, Copic Markers and airbrush system, Atyou Spica pen, Uniball White Signo pen, Nestabilities, Memento and Distress inks, AC ribbon, u/k button, DMC floss and Kaiser Pearls. Inspiration for my card came from this week' sketch #142 at Sketch Saturday, this week's challenge at Papertake Weekly , challenge #138 at A Spoon Full of Sugar, challenge #74 at Crazy 4 Challenges and this week's challenge #43 at Wee Memories! Very sweet. Like the bows and ribbon and lace! Cute couple too. What a cute card, made me smile! Too cute Steph!!! I love how you used the ribbon and the lace together. Fabulous colouring!! 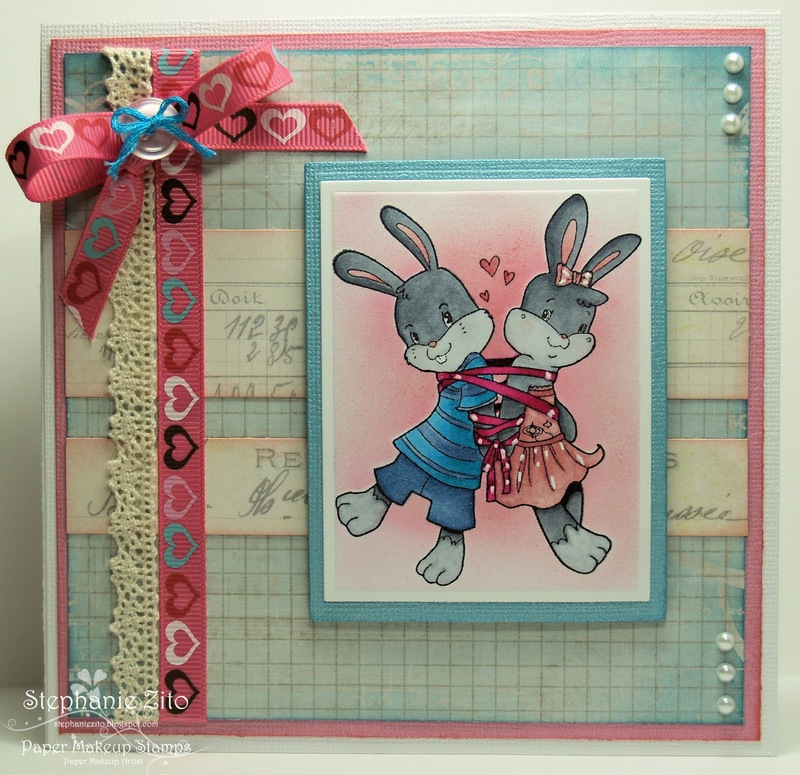 The ribbon and lace are so pretty, great way to accent those cute little bunnies. Thanks for joining us at Wee Memories this week! Oh wow, this is absolutely stunning! What a gorgeous colour scheme and fab image too! What a sweet image & beautifully colored! Thanks for playing with us this week at Wee Memories! Now that's CUTE! LOVE those soft colors, too! Thank you so much for playing along, this week, in Wee Memories Scrappy Saturday Challenge!